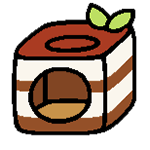 12.13.2015: If anyone was interested in a dog version of Neko Atsume, please check out this post! If you have any more questions for me, please feel free to leave a comment! I’ll do my best to help you. (Because of some comments I received, I should clarify that I’m in no way affiliated with the developer and only translated bits and pieces of the game!) Also, if you can, please take screencaps if you have a question with text or something! It’ll be easier for me to understand what you’re talking about. 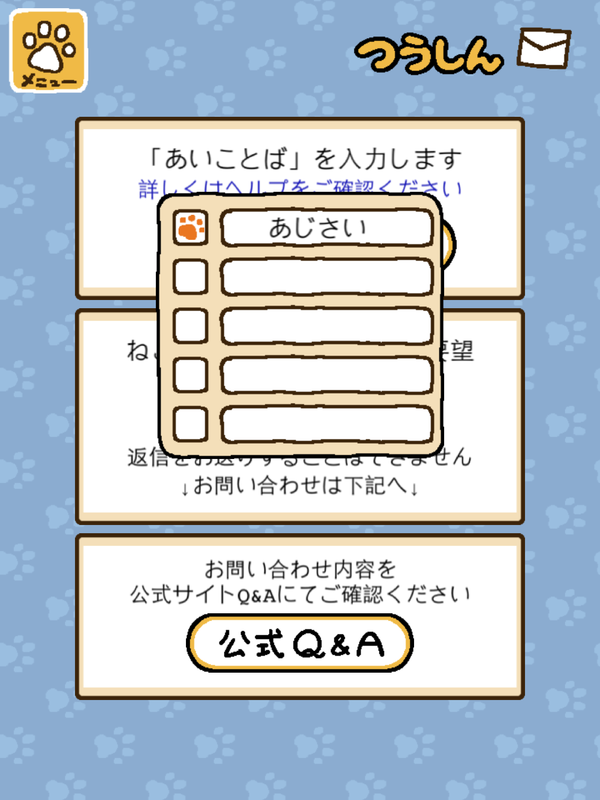 How do I download Neko Atsume from the iOS App Store or Google Play? Here are the links for the game in the US iOS App Store and Google Play. In case the game still isn’t available in your country’s store, please let me know. 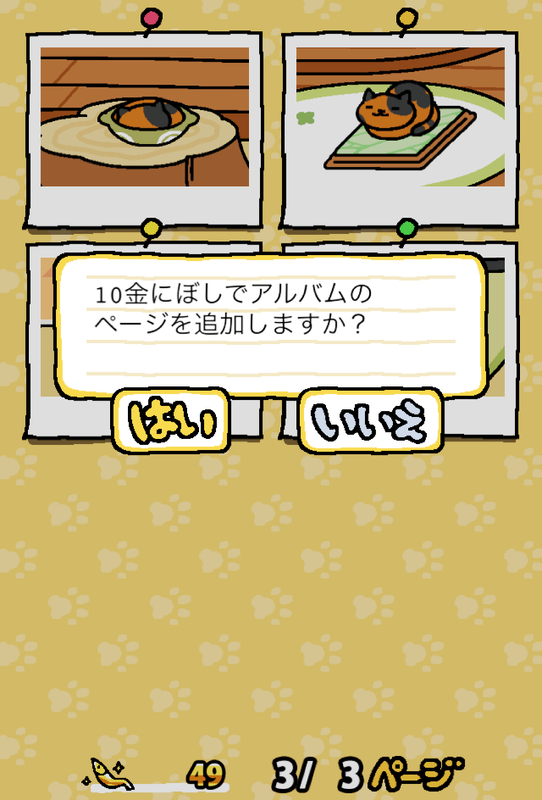 How do I switch the language in Neko Atsume? If you are starting a fresh game, the game will ask you at the beginning to choose Japanese (left option) or English (right option). If you are continuing from an existing game, there are two ways to change the language. At the beginning of the game (where Hit Point’s logo is shown), tap the cog at the bottom right-hand corner to open the settings. The second way is to open settings from within the game’s menu. How do I play Neko Atsume? The tutorial is pretty self-explanatory, but be sure to tap where the arrows instruct to move forward. The game won’t let you purchase items freely until you finish the tutorial, so just keep tapping the arrows. To get cats to come visit you, you need to leave out food and some toys for them to play. 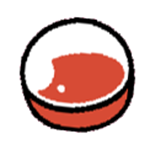 Tap the bowl of food to refill, or if you want to exchange your food for something more high quality, then go to “goods” and pick the food you want to replace with the existing one. Food will run out eventually, so check every few hours to refill the food. (If you extend your house, be sure to put food in the other half of your house, too.) You will want to check the app occasionally anyway to you can catch some cats to log into their profiles. If you miss a cat, they’ll show up as a silhouette in their profile until you’re able to see them in action. 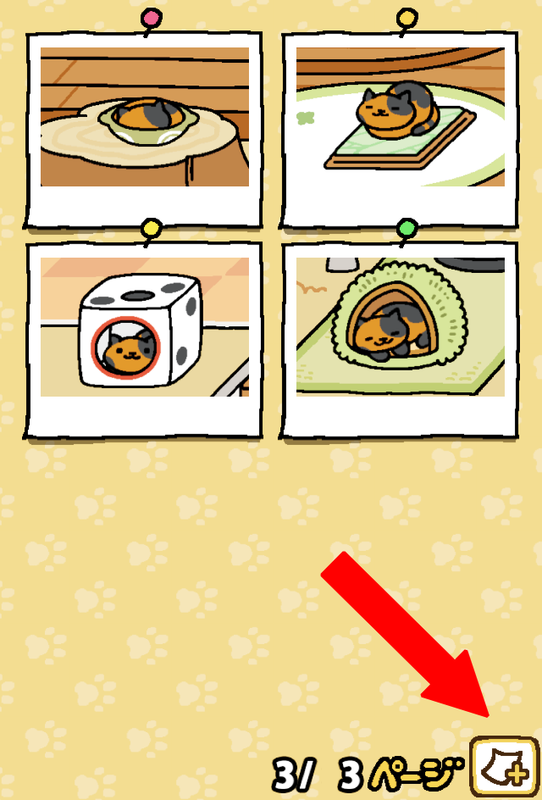 The same goes for the toys you leave for cats to play; just click on “Goodies” and pick some items to leave out. 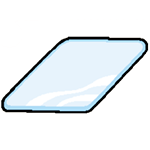 Some items are large and can only be placed in the middle. There are “S” and “L” icons to indicate which items are small and large respectively. For reference, here is a screencap of the default theme’s extended garden to show you where food bowls and items are located. 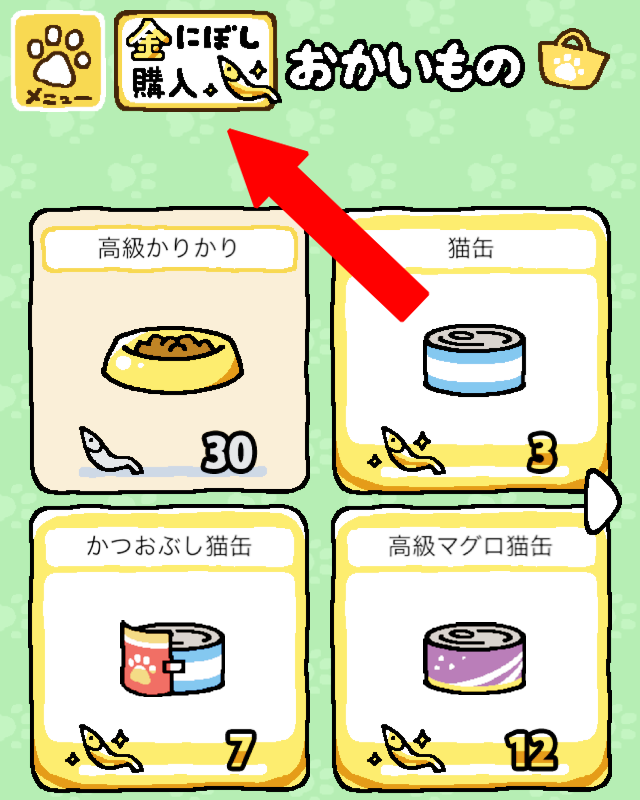 The location of food bowls and items WILL change if you change your theme. When cats visit, you can tap on them to view their profile. You can take pictures of them as well, which go into their album. How often do I need to refill the food? There are six different types of food with varying times to completely consume. 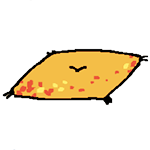 Ritzy bitz, bonito bitz, deluxe tuna bitz, and sashimi require gold sardines to purchase. What does the menu say? The layout of the menu has changed with version 1.3. “Cats” and “Etc” have sub-menus. Sardines: Where you can view and collect the sardines cats have left you as thanks for the food and goods. When you have fish ready to be collected, there will be a little speech bubble at the bottom of your garden that you can tap as a shortcut. Settings: Where you can adjust the volume of the background music and sound effects. As of version 1.2, when you’ve started the app, you can also change the volume by tapping on the cog in the bottom right-hand corner. News: Has links to leave a review, to make a tweet about the game, and to other games from the same developer. 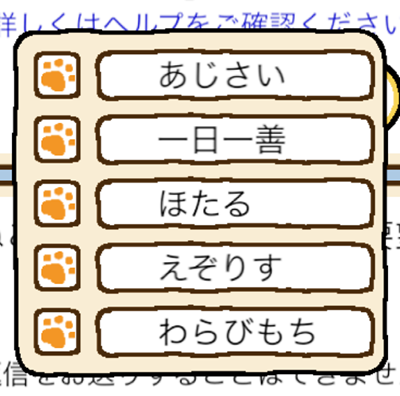 “あいことば” (the daily password) is located here on the board held by a cat. Remodel: Where you can remodel your house/garden. You can purchase different models for quite a bit of gold sardines. Once you’ve purchased some, tap here to remodel. This option only appears after you’ve expanded your house. If you haven’t, this option appears as a paw print on the menu. What does the cat’s profile say? How do I change the names of cats? 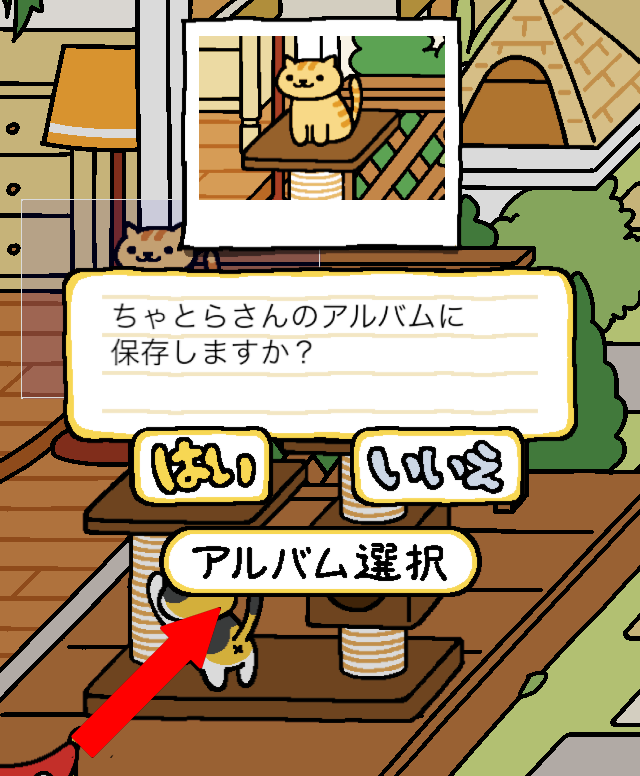 Tap the box at the very top, enter in your desired name, and hit “決定”. To cancel, hit “やめる”. Do the cats’ “fighting strength” mean anything? I’m not 100% sure about this, but I heard that a stronger cat will push a weaker cat out of the way if it wants to play with the same item. How do I get rare cats to visit my garden? If you have higher quality food out that’s not the default food, more cats (and rare cats!) will be more likely to visit. If you have a special item out but a rare cat hasn’t visited yet, just be patient! 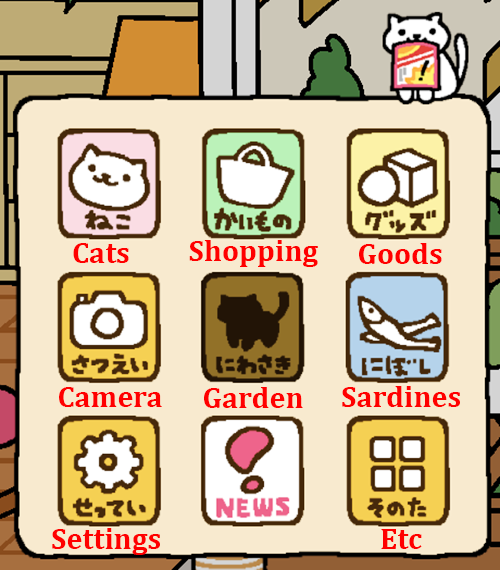 When you collect enough sardines (the currency in this game), you can click on “shopping” in the menu. You can’t buy non-food items more than once, so those items will be marked with “買” so that you don’t have to worry about having doubles. You can also exchange gold fish for normal fish or vice versa if you need to. Where do I exchange normal sardines for gold sardines? It’s also located in the shopping menu, after all the food items. Trade 10 gold sardines for 250 regular sardines, or trade 500 regular sardines for 10 gold sardines. How do I buy sardines with real money? When you open up the Shopping menu, you’ll see the option to buy sardines with real money at the top. 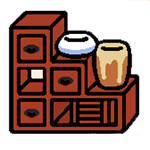 What are the names of the items? 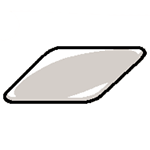 Version 1.4 items start from the glass flower vase. Neko chigura: A type of cat house made of straw. Click here for more info! 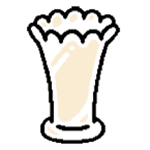 Chikuwa: Tube-shaped food made of fish paste. Commonly seen in dishes like oden and hot pot. Click here for more info! Cat macaron: For anyone curious, it’s an actual merchandise. Dorayaki: A Japanese confection that’s kind of like two pancakes filled with red beans. More info here. How do I take/rearrange/delete pictures? The layout and features of the album has kind of changed as of version 1.3! When you tap on “album,” you’ll see this long list of cats, along with numbers. Each one is a specific cat’s album, showing how many images are in each album. You can keep a maximum of eighteen images in an album, so if you see “5/18,” it means you have five images out of the max of eighteen in that particular album. The very first option is the “free” album, where you can keep a collection of all/any cat you wish. It can hold a maximum of 48 images. Tap on the camera in the menu. Tap on the desired cat, drag the viewfinder around if you want to adjust, and tap the camera icon to take the picture. The image will go into that specific cat’s album automatically. You can tap on this button to move the image to another cat’s album or to the “free” album. If you want to take a picture of the entire garden without the little fish icons in the bottom, tap on the icon with the hills at the top. 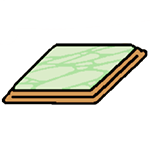 (Once you’ve expanded your house, there will be an icon with two hills, which will take a picture of the extended portion of your house, too.) Tap on the camera icon, and the picture will be saved directly to your phone. To go back to taking pictures of cats, click on the cat icon at the top next to the hills icon. Tap once on your desired picture to select it. After that, you can drag the picture around to the spot you want to move it. There are now two ways to delete pictures. The old way: Tap once on your desired picture to select it. Hold it for a few seconds, and an option to delete will appear. Tap “はい” to confirm or “いいえ” to decline. The new way: Tap once on your desired picture to select it. Tap “さくじょ” at the top to delete a picture. Tap “はい” to confirm or “いいえ” to decline. Tap once on your desired picture to select it, and tap “いどう.” It will pull up the list of all the cat albums, including the “free” album. Choose the album where you want to move your picture. Tap once on your desired photo to select it. Tap it once again to see “best shot” labeled on the photo. The image with the label “best shot” will be used on that cat’s profile. When viewing your album, tap this icon to add additional pages. It will tell you that it will cost ten gold sardines to add an additional page. Tap “はい” to confirm or “いええ” to cancel. Note that you have a max of eight pages in all cat albums and sixteen pages for the “free” album. Pinch two corners of the viewfinder to zoom in and out of the photo. Take the picture as usual. How do I get regular/gold sardines? Cats who are done leeching off you will give you fish as thanks. Most will give you regular fish, but sometimes they’re not stingy and will give you gold ones! I’m not sure what determines the amount of fish they give you, but I think the longer they stay, the more they give (as is the case with Manzoku-san, who will leave immediately once you refill the food, but he’ll give you 20-30 regular fish if you let him have his fill). Rarer cats usually will give you more fish than regular cats, too. 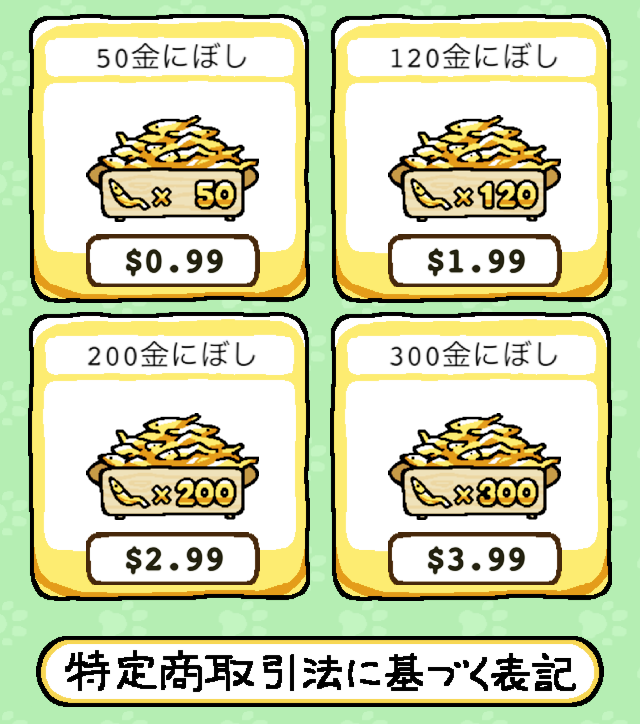 You can also purchase gold sardines with “real life” money, which can be found at the top after you’ve tapped on “shopping”. Sometimes you can get a few extra gold fish from “あいことば” as stated below as well. 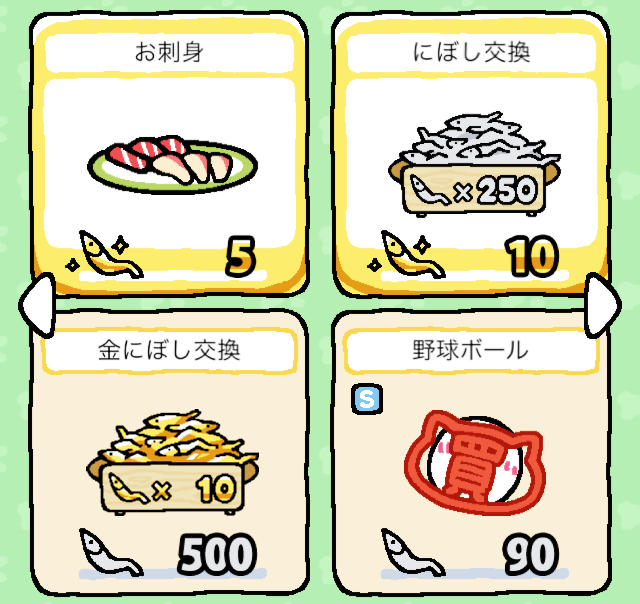 If you’re in a hurry to get lots of sardines, Manzoku-san and Koikoi-san tend to give more sardines and are easier to attract than other rare cats. The screen faded to black, and a cat walked across the screen. What’s happening? When a cat has visited several times, there is a chance that it will give you a treasure. 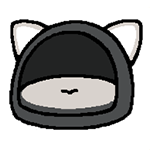 These treasures will be added to a cat’s profile, along with a small description. When the cat walks across your screen, it will wait in the middle. Tap it to receive the treasure, and your game will resume. I believe the number of times a cat must visit before you receive a treasure is random because I’ve seen varying numbers being reported. Anyway, it’s just something to look forward to if you want to complete every cats’ profile. How do I expand my garden? When you tap on “shopping,” scroll all the way to the end to find this preview that costs… 180 gold sardines! It’s expensive, but it will expand your garden/house so that you can set out more items for more cats to visit. Remember to set out food on both sides of your garden! If you’re having trouble getting gold sardines but don’t want to resort using real life money, you can exchange 500 regular sardines for 10 gold sardines under “shopping” or enter the daily “あいことば” like I stated below and pray that you can get some gold fish. It’ll take a few days to get to 180 gold sardines, but it’ll happen! Also, you can only expand your house once. How to I remodel my garden? Note that each time you change your theme, your items will go back into your inventory, as the locations to place items change with each theme. Your food is safe, though, in case you’re using expensive food! “あいことば” means password. 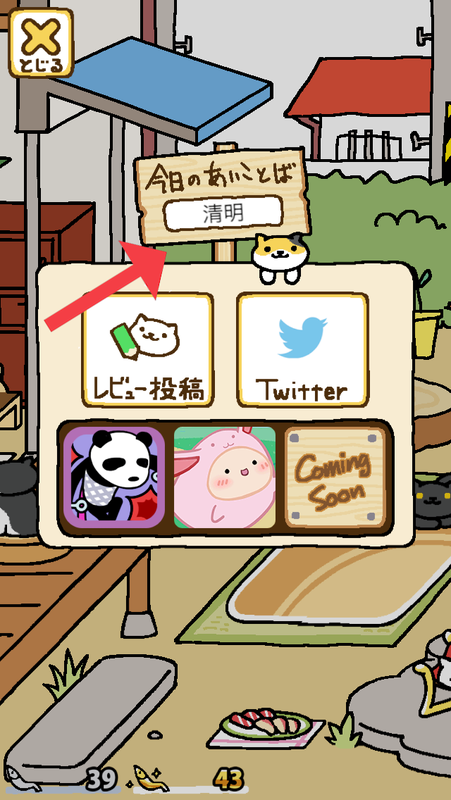 If you tap on “news” on the menu, you’ll see a cat with a sign that says “今日のあいことば” (today’s password). By entering the daily password, you can get some free fish! You can do this once daily as the password changes everyday. (I think it changes at midnight JST). The amount and type of fish vary daily, and sometimes you can even get both regular and gold fish at once. I’ve been told that iOS and Android versions of the game have different ways of getting the daily fish from the password, so I’m going to list the different methods! These methods are for version 1.3. 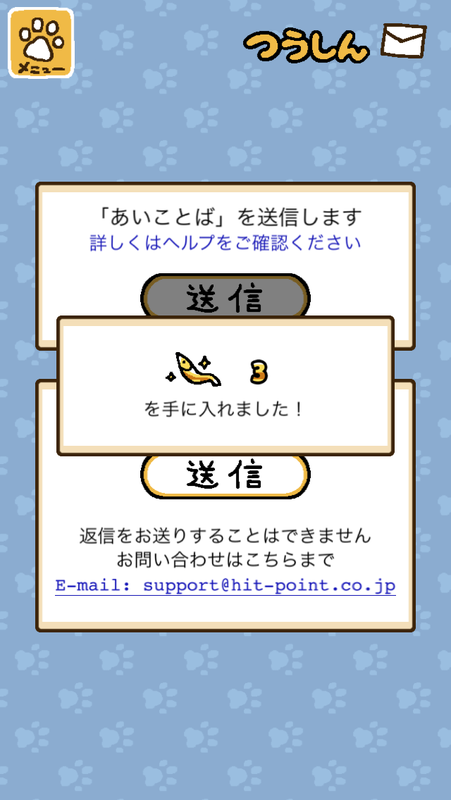 Tap on the first option (“あいことば入力”), and you will get your daily fish, with no need to type anything in. For Android users, the password is published daily on reddit here. There’s also a IFTTT recipe that can send you the password to your phone using Pushbullet. Thanks Phermaportus for telling me about this! I know some people were looking forward to practicing writing Japanese characters, so I’ve left the original ways to get the password below. Remember the word listed on the board labeled “今日のあいことば.” Go back to the menu and tap “つうしん” (the icon to the right of “news”). Tap on the top link to enter the password. After confirming, you’ll get some free fish! The password is in Japanese, so you’ll need a Japanese keyboard to input the word or need to be able to copy/paste the word from elsewhere. → What if I don’t know Japanese, or what if I don’t have a Japanese keyboard installed? You can use Google Translate! There are two ways you can use the Google Translate app: by handwriting characters via the scribble option or by using the camera/OCR option. 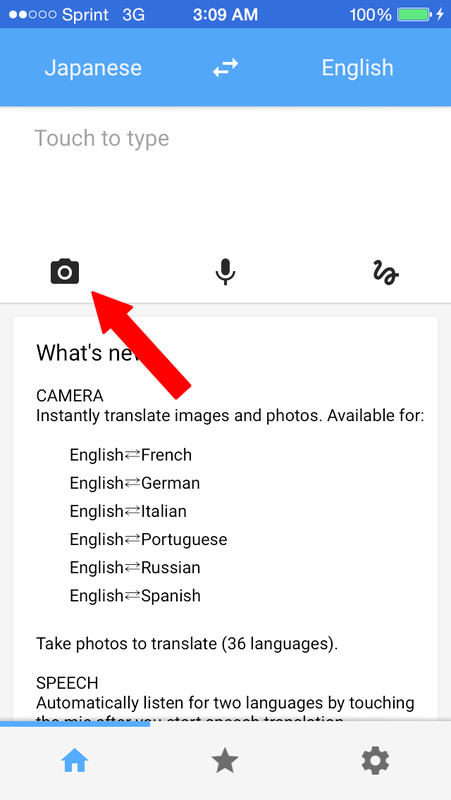 This works on both the mobile and app versions of Google Translate! Tap here to switch from keyboard input to handwritten input. Handwrite the characters and hope that Google Translate won’t mistake the characters for another word. (Sorry, my penmanship on touch screens is so atrocious!) 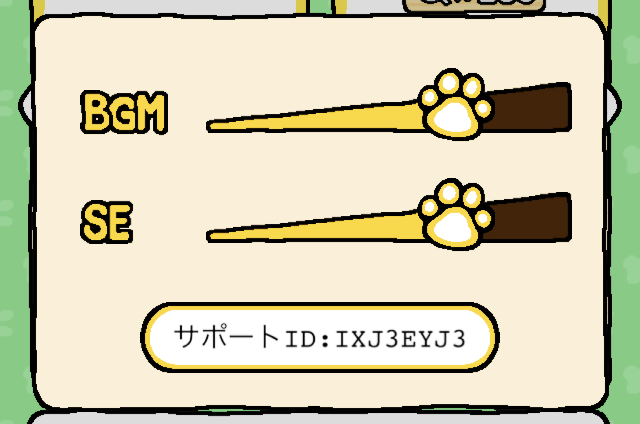 You can then copy the word from here and paste it back into Neko Atsume. 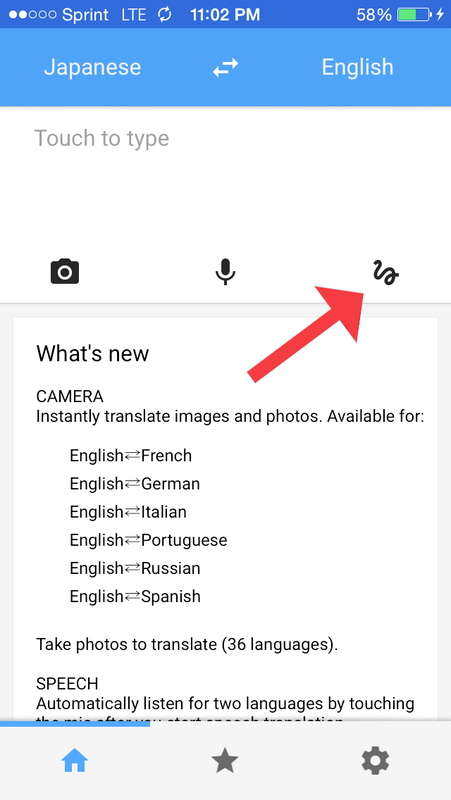 The Google Translate app now has an OCR function! I still prefer the scribble option over the camera/OCR option because the camera option has failed me too many times. 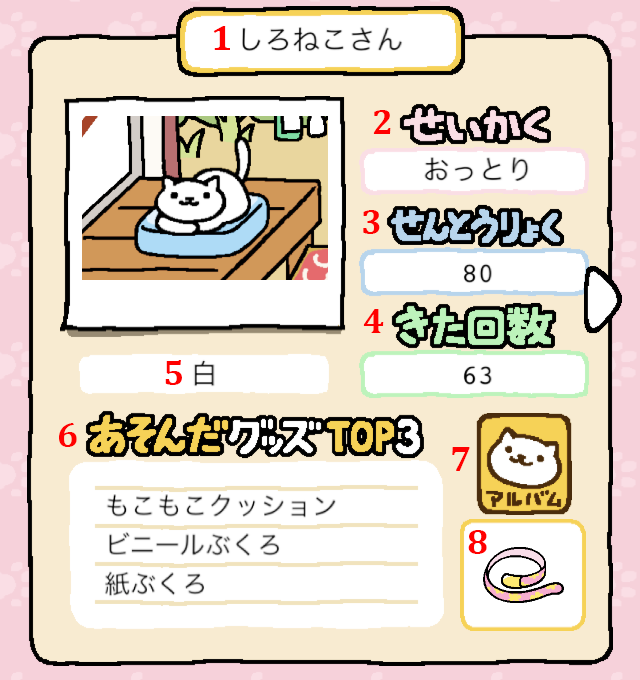 First, take a screencap of your Neko Atsume game with the daily password. 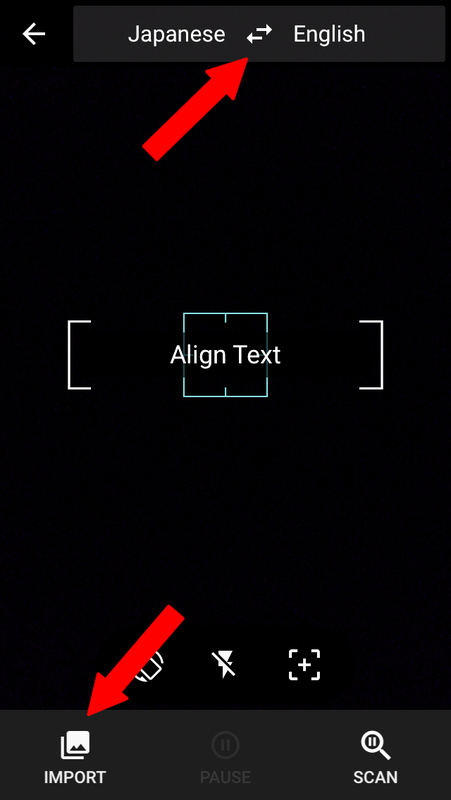 Tap here to use the camera/OCR function. Make sure you have the translation set to “Japanese – English” and tap “import” to choose your recent screencap. Highlight (by swiping with your finger) the daily password to get a read of the characters and its translation. You can then copy the characters and paste it back into your game. But as you can see here, the app failed to read the word… I had seen some people mention using Google Translate’s camera app, so I thought I should add it here as well in case anyone is having trouble with the scribble option. There’s a comment below that suggests using a separate OCR app for Android devices, so please check it out if the Google Translate isn’t working for you! What’s this list that appears after entering the daily password? A new feature with version 1.3, the daily password now comes with a stamp card! When you’ve filled in five passwords, you’ll get a present! I don’t know if the present will change each time, but I got canned cat food for my first present. If you miss a day, your stamp card won’t reset! You will continue to receive stamps from where you left off. Is there a way to stop Manzoku-san from eating my expensive food? Just make sure that your expensive food is located on the half of your garden with the food bowl located toward the top of the screen. For example, with the default theme of your garden, you would need to put your expensive food on the left half. With the pond and alcove theme, you would need to put your expensive food on the right half of your garden. Thanks to everyone who gave me a heads-up about this tip! My garden has absolutely no cats, or cats won’t visit the other side of my garden. What’s wrong? The only thing that will keep cats from visiting is the lack of food. Check your game occasionally to make sure your food bowls aren’t empty. If you’ve expanded your garden/house, don’t forget to put food in BOTH halves. Once you’ve refilled your food bowls, cats won’t visit immediately. Leave your game alone for maybe a few minutes and check again. If you see a message that pops up on your new half of the house (which Google Translate translates as “rice is not grounded”), it means you didn’t put food out! If I leave my app open for long periods of time, will cats still visit? No. You need to either leave your game idle or force-close your game. Check back once in a while to check to see if you’ve gotten any new cats. It seems like this game was designed to not require a lot of attention, so constantly checking it every other minute won’t reflect any big changes. What’s this cat doing, sitting on my menu? He’s just advertising for other apps! 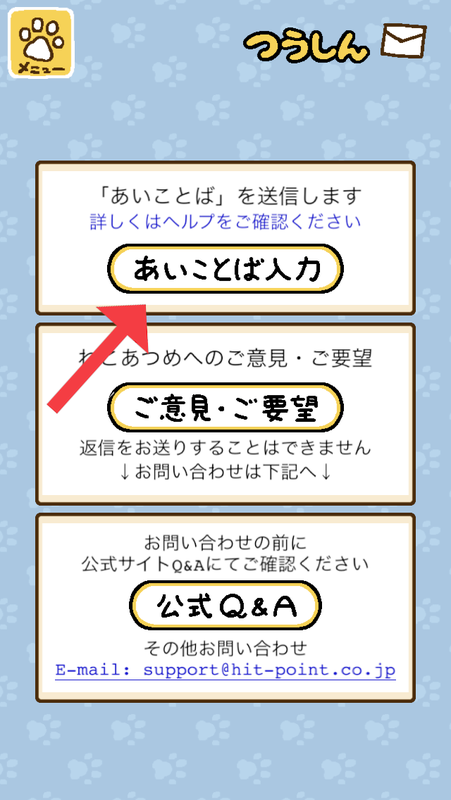 If you tap on the cat, it’ll say, “Do you want to see the flyer (cat)-san is holding?” Tap “はい” to see a link to another app or tap “いいえ” to decline. The cat doesn’t always appear on top of your menu, and sometimes the link to another app won’t generate, so don’t worry if you don’t see an ad. Can you transfer data between iOS and Android? But I’ve been able to save my game data by backing up my phone to my computer (and I have iOS). I’ve wiped my phone to factory setting several times (because I abuse my phone a lot, haha), and I’ve had no problems with Neko Atsume after restoring a backup I’ve saved. I’m assuming the same method will work for Android. What does the support ID do? If you tap on Settings, you’ll see where to adjust the volume of the BGM and sound effects. Underneath it is a support ID. This is used when you are sending an inquiry to the developers about any problems with the game. It’ll ask you to leave your support ID so they can communicate with you. If you tap on your support ID, it’ll explain this in Japanese. Can my cats get fleas? The first time I got this question, I thought it was a troll and deleted the question. Surprisingly, this question has been asked several times after that, and it has even been Googled several times, too! On the same note, just because the cats have cute little buttholes drawn, doesn’t mean they’ll poop all over your garden. It’s just not part of this game, haha. 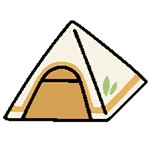 This entry was posted in mobile, walkthrough and tagged neko atsume. Bookmark the permalink. Sure thing!! I’ll update it when I get home! Yes! The new way to get daily fish works, no need to type in Japanese! Thanks for that tip! In the 1.2 version there is a little house in the bottom left of the menu, is it to buy house and gardens extensions? Thanks so much for verifying the daily fish/password for me!! I can’t seem to download it from the store! I just get a blank icon on my iPhone and a waiting message! I think that has to do more with your internet connection because that has happened to me when I’m in my dorm! What iOS and device do you have, just in case? Thank you for this guide! I have a question about something unusual happening in the game – twice, on open, I have seen a blacked-out screen overlaying the garden, and then one of the cats comes to the center of the screen. If you tap on the cat, a short flashing animation with a picture of an hourglass displays, with some text in a sign underneath. Then it disappears and shows you your typical cat garden view. What does it mean?????? It’s the treasures the cats bring that I mentioned in the guide. 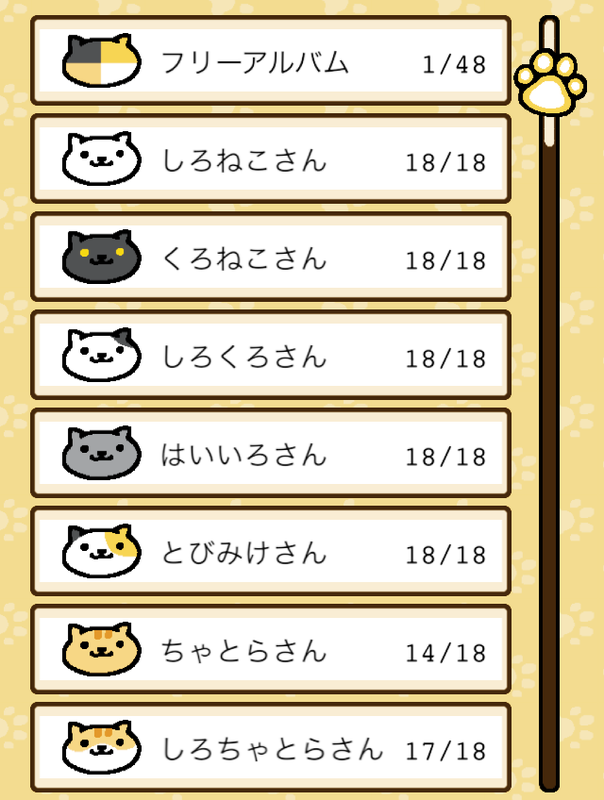 Each cat has a different treasure they will give you once they’ve visited several times. Pingback: Why am I obsessed with this Japanese cat game? Your instructions have been so incredibly helpful. Thank you so much for your time. I have one question you might be able to assist with. You gave such clear instructions about using the scribble function in Google Translate for the password, which I had never considered using before but works really well. I was really looking forward to learning kanji! When I realised this is no longer needed, I was disappointed! I note however that the password still appears in the sign on the news screen. Do you know what use this the password is now? Hi – I expanded my garden, and am wondering what the llittle pop-up alert just inside the door, above the little…drawer? Platform? says. It appears whenever I log in to play. Could you possibly take a screencap for me? Long story short, my phone crapped out and wiped my game, so I had to start over and haven’t expanded my garden again, haha. Oh, this game is so cute! One question, though — I expanded my garden, and now whenever I start the game there’s a little alert pop-up above the platform/drawer/whatever-that-thing-is just inside the door. (The thing in the picture under your “how do I expand my garden” section). Do you know what that message says? I don’t remember having an alert when I expanded my garden before, and I asked my friend, who also said she doesn’t have an alert ;A; but if it’s above that platform, my guess is that it’s a reminder for you to put food there since that’s where food goes for the house half of your place. Let me know if this works! I put a food bowl there, and it seems to have done the trick! Thanks! Thank you for this guide. It has been very helpful and I am hooked on this game. I’m hoping that you or others might advise me on what I’m doing wrong in trying to get the daily fish. The short updated method described does not appear to work for me and it would be so helpful if someone could help me. I have been able to use Google translator to recreate some words and earn fish that way, but I cannot always get the characters correct or see them easily if they are very detailed. Hi! Have you updated your game to the latest version (ver. 1.2)? I’ve asked around, and no one I know with the latest version is able to type in the password anymore. If you’re still using google translate to handwrite characters though, there’s not really any tips to give because sometimes Google translate will misread my characters even after inputting them several, several times 😦 if you want to go the extra step and are familiar with stroke count of characters and radicals, you can go to jisho.org and look up kanji. 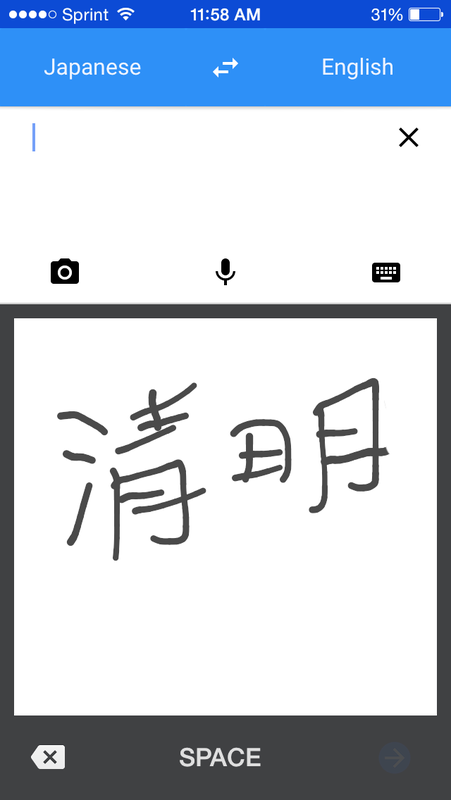 On the mobile version of jisho.org, there is an option to look up kanji characters by radical easily on the bottom right-hand corner. Once you’ve found the kanji you’re looking for and are on that kanji’s page, it will show you the stroke order of how to “correctly” write the character. Sometimes Google translate will recognize a character more easily if it’s written in the correct stroke order. Hope this helps! If it absolutely doesn’t work, you can always comment here with a screenshot of that day’s daily password, and I can reply to you with the password for you to easily copy/paste it into your game 🙂 I’ll try my best to answer as soon as I can, but I can’t guarantee I can reply immediately! As far as I know, notifications aren’t supported by the game yet. It would be nice to have some for when food runs out though! Sorry but when i type in the password for the day and press confirm, the game just automatically shuts down and i get nothing and i have to run it again. Do you know how to fix such bugs ? Thank you in advance. 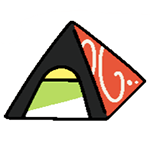 Have you updated to the newest version (ver. 1.2)? In the new version, there’s no need to type the password anymore. It might be crashing because it’s an older version. 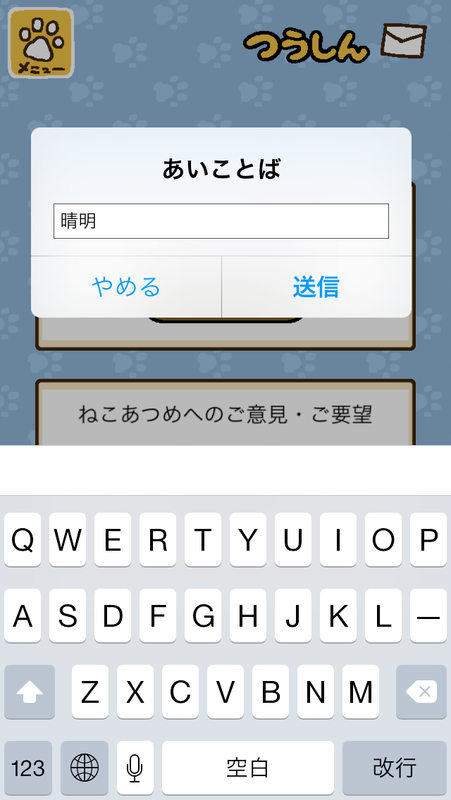 In the updated version, you just need to tap the board with the password, and it will direct you to “つうしん,” where you tap the first option to “enter” the password you viewed. Can I ask what device you have? I can ask my friends to see if they have any solutions for you! I’m very delightful that you offer me your help. Thank you so much. I’m using samsung glaxy A5 for now. Could you possibly take a screencap of your error when you try to buy an item? I’ve never heard of this error before, but I can ask around to see if anyone else has encountered this. When you’re trying to buy items, have you finished the tutorial yet? TomTom, I had the same issue. I have to bring up the app switch menu and then get back into the game to get past it. (Double click on the round button below iPhone/iPad screen. Thanks so much for this tip!! I’d never encountered this before, so this is a huge help! Hello! Thank you so much for this guide it has been unbelievably helpful! I’m having an issue doing the daily password with the update and I’ve checked and I have version 1.2.1! Could you perhaps post a few screencaps of how to get the daily password done with the update because I think I might just be doing the wrong thing! I’ll update this post when I have more time after exams, but to get the password with the updated version, all you have to do is tap the board with the cat under “news.” It’ll redirect you to “つうしん.” Tap the first option to “enter” the password (you won’t actually type anything; now the game recognizes that you’ve already viewed today’s password), and you’ll get your free fish. The “free” fish doesn’t work for me after entering the password for the day. I have a Samsung Note 2. This make me sad. Unfortunately, I’ve never had an android device before, so I’m not familiar with them 😦 I can ask my friends to see if they’ve had any problems with the daily password. Do you have the latest version, and is this your first time trying out the password? Thanks for this detailed guide! 🙂 Really helped. No… The only one that is most likely male is Maromayu-san the attire he wears is for male attendants. Hi! I feel I should point out that, as of at least a few days ago, neko atsume is openly available to westerners on the Play Store. You don’t need to use a VPN anymore. Can you show us each part of the cats’ profiles? You mentioned strength, but which area is that? Thanks! The box with no label is its physical attributes. Thank you so much for the guide! I recently downloaded this game and your guide has been extremely helpful. I just wanted to let you know that my version 1.2.1 on an android tablet still requires the pw to be entered for free fish. Takes a little extra time but no biggie. Hopefully another patch will fix this. Hi. 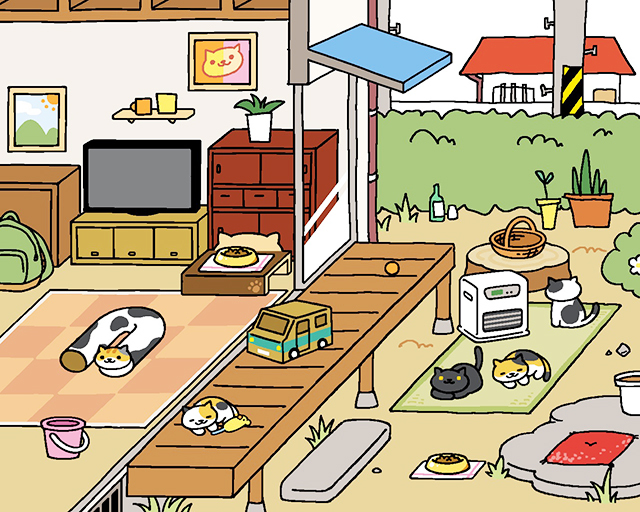 I created a facebook page for Neko Atsume: the backyard cats. I would like to publish some of your useful tips and guides to play it. Would you allow me to publish it? Yes, that’s fine. Please link back to me! Thank you for the very detailed guide to the game, it’s saved me from resorting to my very rusty Japanese. Just a quick question. Can I prop up my iPad, leave the app running and actually see cats leave and enter the garden, or do they only change when I open the app? Cats will only come if you leave your app running in the background or if you close your app completely, as far as I know! Thanks for the help! I accidentally didn’t allow to access my photos. Any way to reverse this? I’m assuming you have an apple device, so go to settings and scroll down until you see the app (ねこあつめ). 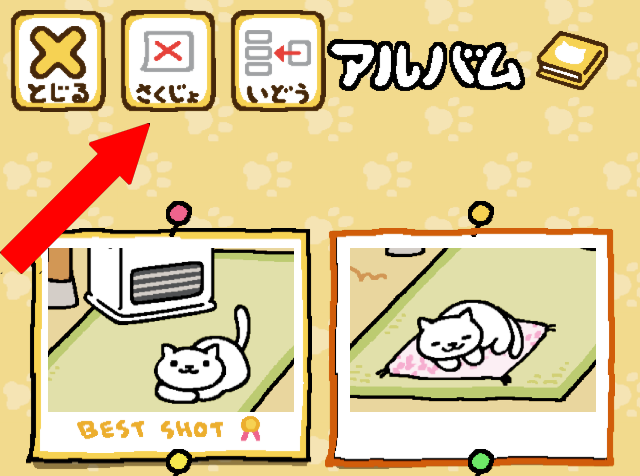 Tap on it to see “allow ねこあつめ to access” and toggle “photos” to on! Thanks so much for this tutorial! I lived in Japan as a child but that was a long time ago, so my Japanese is very rusty. Fortunately I remember the kanji stroke order well enough to use the Google translate app like you showed here (so useful!) and I have used that to copy/paste into the app but it doesn’t look like what you pictured. Instead, I just get a black screen. Then when I paste in the word, I get a message (which I translated using the Google translate app again) saying there was an authentication failure. I have version 1.2.1, which I don’t know if you’re familar with. It seems to work differently then both the examples you have described. Does any of this see like something you’ve come across? I’ve never heard of this error before, but!! I’m assuming you have an android device since I believe the iOS version doesn’t need you to type in the password manually anymore. Another person commented earlier with the suggestion of using an OCR app instead of google translate, so I would try that out to see if it works better! Let me know if you have any more questions, and I can ask around. Hi, the page isn’t allowing me to respond directly to TomTom above, but I figured out what his problem was after the same thing happened to me. The red circle isn’t an error message, it’s telling you that the first thing you have to buy is a red ball. It won’t let you buy anything else until you’ve bought the red ball from the tutorial. So you have to swipe until you get to the page with the ball on it and purchase it (that’s what those nagging arrows are telling you to do). Thanks so much for this! I went through the tutorial so fast and don’t remember anything from it, so it didn’t even occur to me that the “error” they were was just the red ball, haha. Thanks again! the cats still wont come even though i put out like a hundred items….. what should I do? Are you sure you put food out for them? An empty bowl is the only thing that will prevent cats from coming. I can make a screencap later once I’m done with exams and am able to update this post! For now, I already translated this in an earlier comment. Thanks for your reply to the error message I was getting for the daily fish (Android, version 1.2.1). I have been able to get the fish now for the past three days and thought I would describe what I’m doing for people who have the same issue as I am. I think one person above has a similar situation. Having copied the characters for the daily password, I then go back to the game and click on the bottom right icon in the main menu, the one with the envelope on it. Click on the top oval, and that brings me to a black page. The section at the top between the two horizontal blue lines is where the password characters need to be pasted. Then, there will be some more kanji characters below that in a grey rectangle. Once you have pasted today’s password into the writing area, you click on the characters below it. That is how you enter the password. Note: I can’t back out of the black screen or do anything else so I always need to close out the app and restart it if I end up there without a new password to enter. However when I enter the password it takes me back to the last place I was, and a couple of announcements appear (presumably) saying that I have entered the correct password and letting me know how many fish I got. Click on these to make them go away so you can return to the game. Hi, today i had a message (an no cats;( on the screen which appears every time i open the app (iOS). do you have an idea? Thanks in advance – and thank you for your guide. Could you take a screencap of the message that appears? Have you had cats come before? There’s also a IFTTT recipe that sends the password to your phone using Pushbullet. Thank you sooooo much for this! I’m gonna edit this post later and add this under the “ai kotoba” section 😊 thanks again! If I buy a new garden theme/expansion, will the cats leave, as if I moved the toy they were playing with? Or will they still be there?? Yes, the cats will leave. Your items will go back into your inventory as well because the positions of the items will change with each theme. Aside from screencapping the way your phone allows you to, the game will save photos directly to your gallery if you choose to take a photo via the camera option in the menu. Just tap the icon with one or two hills to take a picture of your garden. 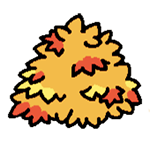 Pingback: neko atsume | clover,love. For those addicted like me. 🙂 This guide is so helpful. This is a great game but there is one problem. When I try to take a picture of my cats, a full black photo appears instead of the cat. Is there a way to fix this? Is this a problem with my phone or the game itself. Hi! I am not playing this game yet, though a friend is, and I am following her updates with great interest. I just want to salute you for doing SO MUCH work on this! Very impressive! Hello! I am playing the game using ios… By clicking on the daily free fish I didn’t get any free fish though… How do I insert the screenshot here? will they ever add new cats and toys ? They made a tweet when they did an update for the iOS version, so I assume that if they plan on making any future updates, they will tweet about it. Hi! Can you take a screencap of the Japanese message? If it’s what I’m thinking of, you haven’t put food on your new half of your house, so it’s just a reminder. What does it mean and how do I get rid of it? It’s saying you don’t have food set out. Cats won’t come to the new half of your house without food, so you need to put food in both halves of the house. I know it may seem a bit long, but it takes me about 30 seconds to do this, depending on the connection. Hey great detailed piece, it really helped :-). I’m currently having a problem that I don’t believe anyone else is experiencing (that I can see) and that is when I try re-naming my cats or entering the password for daily fish the app kicks me out. Anything that requires me typing it kicks me out basically. Any advice haha? I have an Xperia z3 compact and have the latest version? Super helpful tips guide. I’m actually running into the same issues as Shannon in a previous comment. Can you help?? Sorry for my late reply! I’ve heard this bug happens with Android devices but not iOS… But I also don’t know a way around it yet. But version 1.3 was released today (for iOS at least, I’m not sure about Android yet)! Hopefully glitches have been fixed… Let me know if the update will resolve this glitch. I noticed this morning that they have updated some of the layout is the shopping area and added some new items. Also, I noticed this when I got the free fish this morning. Can you please tell us what it means? I’ve already made an update at the top of the post that lists what’s included with the new update. Also, sorry, I wasn’t able to see the picture you included through the WP app! That’s the stamp card for daily passwords. When you’ve filled it out five times, you will get a present. Hi – thanks for your reply. Maybe I’m missing it. I’m not sure we are discussing the same update though as this appears to be new as of the past 12 hours or so, is version 1.3.0 and has lots of brand new items for purchase. It also now has each item marked with either an L in a red square or an S in a blue square. 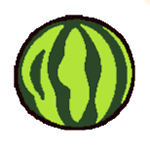 New items featured are a ball that looks like a watermelon, a box that resembles a cafe, some matts – one is square and silverfish and one is square and looks like lime green marble (maybe they are mouse pads!) 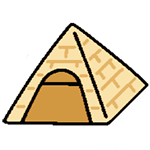 – a few pyramids that the cats cat play and sleep in, a couple umbrellas and what appears to be a vase. If I missed your update on the new version, it’s probably because I was too excited to share about it and didn’t carefully check your posts. Thank you so much for supplying this guide and walk through – it has been very helpful! Ah, I just saw the post update. Thanks! It is updated on Android, too. Yay, new cats! One of the new cats is a pharaoh that comes to the Egyptian pyramid. His name is Sphynx-San, I think. I noticed that the new update isn’t on my iPhone yet is on my iPad. Odd. Thanks! I love this game! I have a question I can’t seem to find the answer for: how do you change the “profile” picture for a cat to one you’ve taken? My cat profiles all say, “no picture” and I’ve taken pictures of some of them but can’t figure out how to put that in the profile picture spot. Probably I’m missing something really obvious. Double tap on the picture you want as the profile pic, and it’ll change to “best shot”! (Don’t double tap quickly though, it’s more like… tap once to select, and tap again to make it the profile pic!) thanks for bringing this up though; I’ll add it to the FAQ! I can’t look at the house! I’m like stuck in the garden is that normal?! thanks for always updating this game! I’m excited to get new cats! I was checking here to see if you had a list of the “treasures” that the new cats bring. I’ll continue to check back. Thank you so much for all the effort you’ve put into this guide. It has made my gameplay much more enjoyable. I love all the effort you’ve put into this website. Very helpful! I have one question, how do you paste the password in? I’ve used Google translate to translate it and managed to copy it. However, when I go to the section to add it in, I can’t seem to find a paste option. Ideas? I’m assuming you’re on Android if you need to input the password. I feel really silly saying this, but I don’t remember how the text box for the daily password looks like since you don’t have to type it in for iOS anymore… TwT But if I remember correctly, a text box *should* pop up when you tap the first option under “つうしん.” Then just tap the text box and paste your text like how your device allows you to. There’s a new update with new cats! Will you be covering it? If you’re changing from iOS to Android or vice versa, I don’t think you can keep your data 😦 but if it’s jut a phone upgrade, I *think* you can retain your data as long as you back up your phone. I was able to wipe my phone to factory settings and resume playing the game from a backup. But let me ask my friends first! As far as I know, I don’t think there’s an option to upload your save data online like some games, but I haven’t checked in a while either. I’m currently working on it! 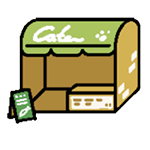 ;w; one of the new (regular) cats has only played with the deluxe cafe for me so far, so I missed it in action. 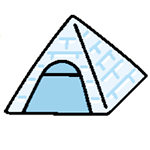 The rare cats are: Sphinx-san with the pyramid tent and Cafe-san with the deluxe cafe! Yes, still have to type in daily password on android. The list of cats who came only showed the cat’s face and the silver/gold fish reward but no toy that each had played with (except the big fat cat that ate up all the food). Thanks for confirming for me! Hi. Have you seen the 2 rare cats in v.1.3 already? Do you have any info on them? Thanks! They’re in the other post that contains the list of cats. An orange cat with a black hat and a black and white striped shirt showed up in the back of my garden. Does anyone know what that means??? how do you receive treasures? i know cats leave them time to time but is there a way or do i have to do something in order to recieve it? a faster way to do it? No, it’s based on the number of times cats visit, which I think is based on a RNG because people have been reporting different numbers of visits for even one cat before they receive a treasure. But I received the majority of treasures for the regular cats within a week or week and half of playing, so you just have to check your game regularly and be sure to refill food/change out your toys for variety. I just got my last cat last night and now I’m sort of bummed. I love watching them but I like the hunt of enticing them and collecting pictures. Any idea how often the update and add new cats?? I realize they just added the four new cat, but hopefully it won’t be months before they upgrade and add a few more. I love this app! I really don’t know how often they update. They usually announce it on their Twitter, but even general tweets are sporadic. I’ve been keeping my eye out on it though, so I’ll update the post if there’s an announcement. This is super helpful! I just downloaded the game and thought it was pretty fun for what I could understand lol With your help I’m enjoying it much more! Thank you! just wanted to say THANK YOU for painstakingly translating each item and making it so much easier for japanese illiterates like me! Hi Great guide! How do I add a food bowl to my expansion? I also included a screencap within the guide of an expanded garden (of thedefault theme) to show where items and food can be placed. OMG thank you so muchhhh!!!!!! I just started to play this game ( Android, version 1.3) and I have a problem with password. Whenever I type the password (e.g 白南風) and press “enter”, I will be got out of the game and get nothing 😦 Have you ever been in this situation? Does the game crash every single time you try to enter the password, or was it just for today’s password? Unfortunately, I don’t know of a solution, and I haven’t heard of anyone having this problem with the current version of the game. If this keeps happening, I suggest going to reddit to see if you can find a solution! I think they talk more about getting around glitches on reddit because i don’t know much about the mechanics of the game (I can only translate), and I’m only familiar with the iOS version >< but please let me know if this keeps happening. I'll ask my friends who use Android to see if they can help. Unfortunately the problem keeps happening 😦 what should I do? Could you post pics of the cats next to their Names, similar to your goods chart? Is it possible to change the garden theme without expansion? No, you need to purchase the expansion first. The remodel option on the menu won’t even appear until you do. One request, if I may: If possible, could you post full screenshots of each of the remodels? I am much further along on my iPad and purchased the first remodel listed. I am now concentrating on buying gold sardine toys to attract rare cats rather than saving for the 280 I need for another remodel. On my phone, however, I’m now using the default expansion and am at 139 gold sardines, almost ready to buy my first remodel. I will buy either the second or third option, but can’t decide which based on the limited picture! Thank you again! You are truly a (kitty) angel. Sure thing! I can post screencaps the next time I update! No, which is why this guide exists. At least, language options isn’t available yet. Okay well it’s helped me quiet a bit seming I read through it again.only you see I did put food and balls and toys and a lot of stuff for my cute white kitten to come back and it still hasn’t 😞 do u know how long it takes for your stray cat to come back and play and eat? It will take at least a few minutes, and you need to close your app or leave it idle in the background for more cats to come. Sorry I have been asking so many questions and driving u crazy but this is a good question 😔😔 how do to get more money because when you spend it it’s gone Im not sure if you can sell stuff. Do I have to pay for more money for my kitties or earn it? 😺😺😺. Because I’m starting to run out of money for my cats I have been spending it all on cat food and toys?. You cannot sell items. More money will come when cats visit, so you just have to be patient. But if you want to get more sardines faster, you can spend “real life” money. But if you don’t want to use real money, you just have to be patient. This game was designed to be slow-paced. I also explained how receiving sardines work and how you can possibly earn more above in the walkthrough. 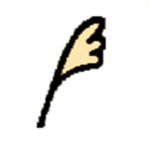 Though you might like to know the staff that is Sphinx-san’s treasure is called a caduceus. I’m well aware. I’m just directly translating from the Japanese text. Hi thank you for this. Just wondering if there would be a way to transfer game data from an old phone to a new phone? If it’s from android to iOS or vice versa, I don’t think there’s a way. But if it’s the same operating system, you just need to back up your phone. I’ve wiped my phone (which is an iPhone) to factory settings twice since playing this game and have been able to continue from a backup of my phone! 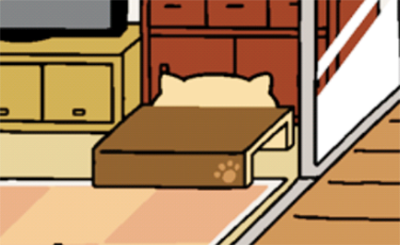 I expanded my house & I don’t know how to put food in the 2nd half as there is no bowl on the bed. 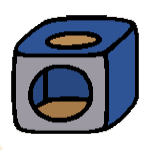 How do I get the bowl please? Go to your inventory and tap on any food you have. Your entire garden will be highlighted with spots you can and cannot place food, so put the food where it allows you to. 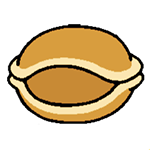 What is a sakuru chirimen? I can’t find it anywhere in your guide…….perhaps I overlooked it? Oops, that was a typo. 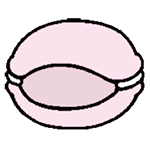 Osamurai-san uses the sakura zabuton, which is the flat pink cushion. Thanks for pointing it out for me! Thank you for all this information. I was wondering if you can help me out on a problem i’m currently having with the app on my phone. Every time i try to rename a cat it kicks me out. I try this over and over and same result. I’ve heard of this happening to some android users, but I don’t know a way around it without having to uninstall/reinstall 😦 I’m sorry! If I hear of another solution, I’ll post it. I’ve heard it’s better to use sashimi to attract her! I was able to get her to visit with high quality crisps, but she’ll more than likely visit with sashimi. I just got this game maybe three days ago. Anyways, now when I play it, a notification shows up. I can tap out of it but it always comes back. And the notification (which, on Google Translate, aside from a few characters it just never got, roughly translated to “We are back monthly total from the previous then exposed is the is the later (the current date and time, different every time I open the app at different hours/days)”) has caused the game to come to a standstill. The cats that were here yesterday never left, the foot bowl is still the same amount of full, and no new cats have come. I’ve never heard of this happening before. If you have a screencap of the notice, I can read the Japanese and tell you what it says (because getting just the translation from google translate is usually confusing as hell). Have you manually changed the time on your phone at all since starting the game, or is your phone jailbroken? 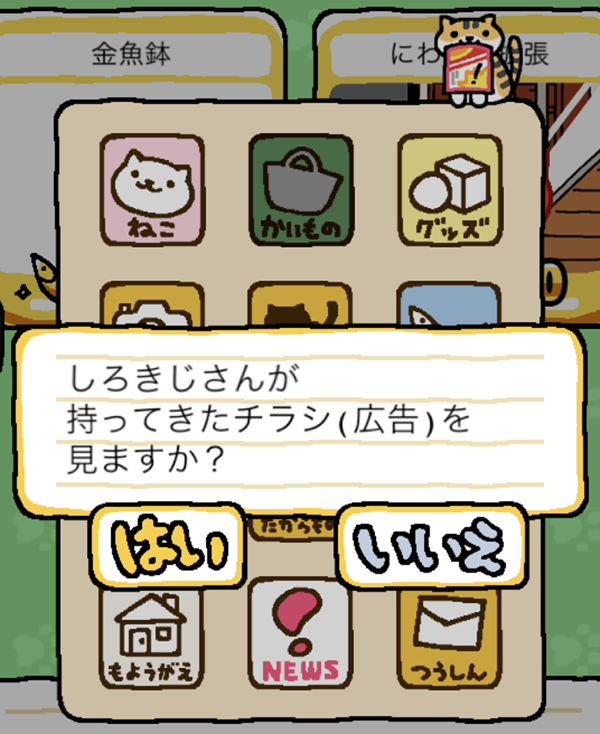 The baseball cat just recently visited me, however, my phone isn’t letting me “click” on him so I can give him a nickname or see his photos or anything? Can you not rename certain cats? Or can you just not click on the rare ones? You can rename rare cats. For Tatejima-san at least, you might have to click around him, like even on the baseball, for his profile to pop up. (This happened to me with another cat, but I don’t remember which one it was ;w;) In the meanwhile, if you want to rename him, you can still do so if you check his profile via the menu. Thanks, but this has already been included in the walkthrough. I change my phone clock and there is this strange notifucation appears and idk the meaning ww can someone help? If you can give me a screenshot of the Japanese, I can tell you what it says. It sounds like someone above had a similar problem (they gave me a confusing google translated message though), and I think messing with your phone’s clock will interfere with the game, and cats won’t come, or the game will be frozen. I don’t know if this is permanent, but I think it’s the game’s way to prevent you from cheating. Did you change your phone’s clock manually? I know the number of times a cat visits before it gives treasure is random but have you/has anyone noticed a maximum number before they will? I’m waiting on 3 rare cats for treasures, and have my garden set up to attract them… so they visit at least once a day but it’s been weeks since I’ve gotten a treasure. I tried changing the toys around to see if that helped, but nothing. Sorry, I don’t know of a maximum either. I’m not sure about rare cats, but I’ve seen differences in the number of visits for regular cats going from 10s to in the 30s. Thank you! I’ve always wondered why my cats never visited me anymore ever since I expanded my house. Ahh thank you so much for this guide!!! It helped me a lot (even though i just started playing today :p) tysm for this! Thanks! 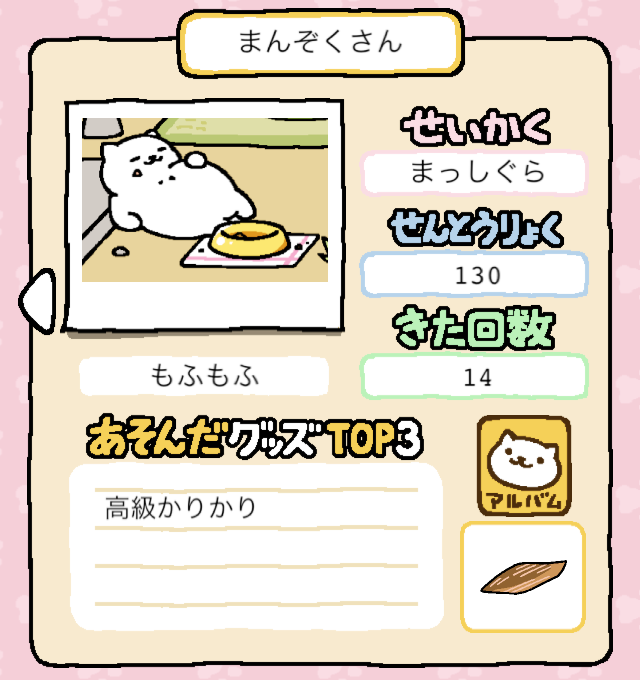 Turns out all I had to do was complain online – already had 2 visits so now just waiting on Cream-san. Amesho-san took 64 visits before dropping hers. Most of my other cats were either before 10 or just after 30 like you said in your guide. 64 is a bit ridiculous c: Thanks for the fab guide by the way! Geez, 64 times! I had no idea it took that many. I actually stopped playing this game like two weeks ago because I gave up waiting for all the treasures, haha. Thanks for letting me know about Amesho-san! Hi – I’m using iOS and when I click on the daily password to get free fish I get a text box with an arrow that points down. I have no idea what this means but I’m getting no fish. Any idea what I’m doing wrong? (sorry, I don’t see an option to post a screenshot). Thanks for the help – I’d be lost without you. 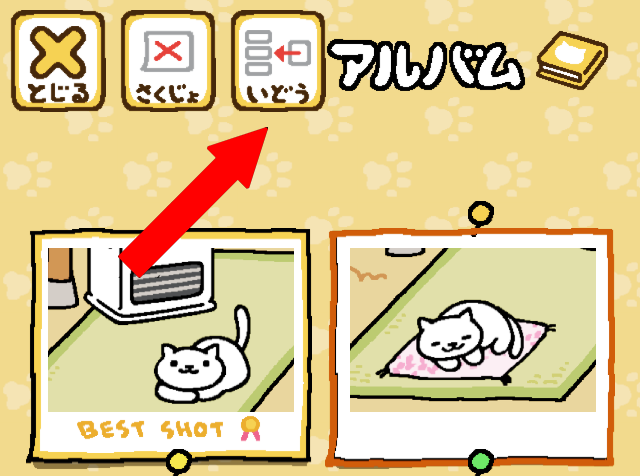 When you’re viewing photos in your cat’s album, just tap on a picture twice! The profile pic will have “best shot” underneath. Let me know if that helps! You can tweet me a screencap if you need to (@dolceconaffetto), but there’s actually an easier way to figure out where you can put food! Just go to your inventory and tap on any food you have. Your house/garden will highlight where you can/can’t put food. Hope that helps! Hi! One thing that I was wandering and coudn’t find in your post is how to change the cat’s “profile photo”. I have taken images of them and the pictures are in each of the cat’s galeries but when I enter their profile it’s just a drawing of the cat’s face and it says “no picture” below that. Aside from that the post was very very helpfull and thank you so much for spending some of your time helping others through the internet. When you’re viewing your cat’s album, tap on a photo twice to set it as that cat’s default picture. It will say “best shot” underneath. Hi. I’ve been playing for 3 days and expanded my garden once. I bought some gold sardines to expand it again, but it won’t let me! It’s very frustrating. Correct me if I’m wrong, but the way I did it last time was in shopping, last option next to vase. Pic of little indoor table. But it has the sold stamp on it. What do I dooooooo??? Please halp! It’s because you can only expand once. The game currently doesn’t have any option to expand it more than that. I love this game! This tut helps me out a lot! I wonder why they don’t make the English version. The options for putting a theme on my garden are locked. Do I have to achieve something first in order to set a new theme? Thanks! First, you have to purchase the expansion of your garden, located in the shop. After that, the option to purchase themes will be available to you. Hello! Do you know if it’s possible to move my game from an iphone to an android? It’s under the shopping menu. 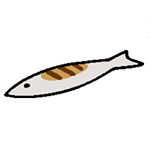 Toward the beginning of the shopping menu (like right after the food items, iirc), there will be two icons: 250 silver fish and 10 gold fish. These cost 10 gold fish and 500 silver fish respectively. Hope that helps! Thank you for the information!! Do all cats leave sardines when they leave? My sardine number doesn’t seem to be going up at all even though I have had lots of cats come and go. Any way to fix this? I don’t know if anyone has already said this; but I think people are asking about fleas because of the cicadas some of the cats will give to you. Just a thought! This is super helpful, thank you for making it! But I do have one request that maybe you can put up a list of the cats with a photo, their Japanese names and translated names. Because right now when you say koikoi-San will leave you lots of sardines I don’t know which cat that is and the name doesn’t help because it’s in Japanese on the app and you don’t have any photos. 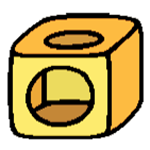 It’s located on a different post named “Neko Atsume walkthrough” that is linked at the very top of the post. Do the remodels have different amount of spaces for toys and stuff? If so, i wanna make the most of my remodel coupon! All the themes (including default) have ten slots for toys. You were a big help in the beginning, so I came back looking for help with restoring the game data to a new device. Have you learned anything more about how it might work on Android? Android doesn’t back up your data to a computer like iOS does. It’s all cloud. When we first installed the game (we know some Japanese, but not enough), we noticed that it asks you about where to save your game data, but it’s confusing and there is no other reference to it in the game. Maybe it’s getting uploaded (as is often the case), and the developer can help, by request? If you have any contacts in the company, it’d be great to know for sure! Hello! Unfortunately, my knowledge about Android devices is near to none… (I thought about switching to android once but figured I spent too much money on games to the point where I’m stuck with iOS now, haha). I tried downloading a fresh game on my tablet (also iOS) to see if the question about where to save the game data appeared, and it didn’t… It might be something unique to the android version. I would suggest going to the reddit thread about neko atsume because they’re pretty active (last I checked), and I’m sure fellow android users could help you. As for contacting the developers, I don’t have any connections with them, but if you wanted to send them an inquiry through the support within the game, they’ll be able to help you. There’s a support ID under settings (if I recall correctly) that you can include with your inquiry so they can keep track of your questions. My friend said she seen them a question once in both English and (google translated) Japanese, and they replied to her in Japanese, haha. This is very helpful!!! 😀 Thank you!! Hello! This was very helpful as I played the game before the English version was released, thank you for the guide! Yes, they do attract different cats! No rare cats though (in the case of rubber balls and buckets), so it’s up to you if you want to save your money and spend it on a different toy that attracts the same cats. I ended up playing aggressively and had a lot of leftover money, so I ended up getting all the items eventually, hehe. Hope this helps! I was just wondering, how long will it take before my first cat comes? I listed this in the post, but you need to leave your app idle or closed before any cats will visit. It’ll take between one minute to a few minutes. Hello! Thank you for the amazing guide. I updated the app today and now I don’t get an option for the daily password. Do you happen to know anything about that? Have a great day!! Can I ask which version you have and if you have Android or iOS? I have version 1.4.5 on iOS, and I still have the daily password option. Sorry, I made a typo on my last comment. I have your version (1.4.6), and I still have the daily password. Under the English settings, it’s still under News on the wooden board. Does the wooden board not appear at all? Well, the little wood sign at top isn’t there and neither is the little kitty. At bottom are the 3 squares that say ‘Coming Soon’. I’ll check it again later. Wonder if they changed it and the wood sign doesn’t show up until it’s been 24 hrs since last password entered(?). That’s strange 😦 it sounds like a glitch, but I have no idea what would cause it. The three squares for me are still filled with links to other games/sites. Try again after a day? I’ll ask my friends who are also iOS users to see if this is happening to them, too. I can’t see any daily password, even connected to WiFi (I have an iOS). Is there something wrong? Two other people have commented with the same problem. The game updated its iOS version last night to version 1.4.7 last night; did you download it yet? I was able to see the daily password with both versions 1.4.6 and 1.4.7. Thanks so much for the info!!! Updated game to 1.4.7 and that fixed it. Password is back!!!! Hello? Does the weather affect the cats if its winter now do i have to put heater in my garden? Weather has no affect in this game. Hi! There seems to be a new rare cat, do you know what it is and what attracts it yet?? The English name is Billy the Cat, and you attract him with the cowboy hat. I haven’t had a chance to update because of exams and work, so sorry about that! Hi, I’m upgrading from a iPhone 5s to a 6s, is there any way to transfer my progress data to my new phone? Cats giving gold fish is completely random, so there’s unfortunately no trick to get them to give you more. Just keep playing, or if you accumulate enough regular fish, then just exchange them for gold fish in the store. How do I expand my garden to the other side of the house? I’ve seen it before- but I don’t know how..? I’ve listed within this post how to expand your garden, but you have to purchase the very last item in the store. It’s listed as “yard expansion” in English. Hi! I wonder if you’ve heard of this problem before. 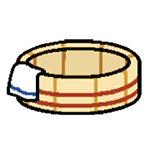 I have trouble with cream-san and tobi-san – they visit, but I can’t take a photo of them. When I try to take a photo (of the individual cat, not the whole garden) the app crashes every time. Someone has suggested I should delete and reinstall the app, but I’m afraid I’ll lose all my progress if I do that. It also doesn’t seem like I can report it as a bug. Have you heard of this or a similar problem and if so, do you know if/how it was fixed? If I to delete the app, will I lose my progress? And lastly, if I use the “feedback” option to report it, will the developer treat it as a bug report? Sorry for all the questions, and thanks in advance for your help. Actually one of my cat’s treasures was a flea. I am kind of worried. The is my first treasure from a cat. If you switch your game to English or view my other post linked at the top of this page, you’ll see that it’s not a flea but a cicada husk. Hi, I know in an earlier comment you said weather doesn’t affect the game, but I just opened the game (I updated it a couple days ago) and now everything is in snow! 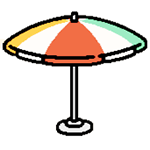 (Which is quite cute) but right now I have a beach umbrella. Do I need to swap this out now and instead put in like a heater? Thanks! I think that’s just effects and doesn’t have anything to do with weather. You never know though since it’s a new update, so you can give it a try. I was only aware that there was one new rare cat, and it’s not with a heater, I think. Enjoyed your instructions regarding Neko cat game. Just started last night, had sev questions.Can I put more then one item of food out at a time (just in the startup garden/yard)?Also, apparently I purchased at least 3 bowls of cheapest food, in “goods” screen ( I think), it shows 3 items purchased – all w fish, not real money. But don’t know how to get that food to bowl, when I tapped on it, I didn’t go. You can’t put more than one bowl of food or more than one type of food for each side of the yard/house. When you’re in the “goodies” menu, tap twice on the food you want, and then it’ll take you to your yard and highlight where you can put your food. Installed the game on my iPad 2 running iOS 9.2, and after two days there are still no cats! Any advice? The game works fine on my Android phone. My only advice is to make sure you’re putting food out 😦 if you’re still not getting any cats, then you’ll just have to reinstall. Unfortunately, this is a pretty common glitch. Your only choice is to reinstall if you really want to rename your cats, but you’ll lose your save data. That, or just keep their default names. Hi ! I have an android tablet E and i try to intall the game but every website i go to redirects me to google play store and it keeps saying either its not available in my country or its not compatible with any of my devices. I have had many other apps that had the same pronlem but i could always find amother website to download it on but unfortunately its not the case with this one. Please help me i really want to play the game. About it not being compatible with your device, I’m afraid I can’t help you there as I don’t have any android devices. I haven’t heard of any problems with any particular android devices or OS that won’t let you download neko atsume, though. I’ve only heard that you can’t download it for Windows devices. As for it not being available in your country, you probably have to use a VPN. 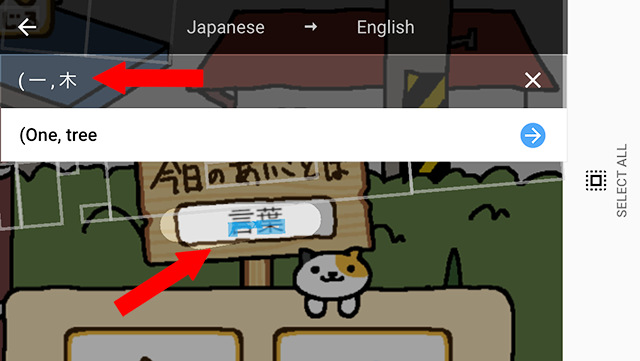 I removed the directions on how to use a VPN since the game is available in English now, but if you click the “how to play neko atsume (Japanese version)” link at the top of this post, I’ve kept my original how-to post that has a link on how to use a VPN. What happens if you replace the toy/bed while the cat is using it? I love this game but it doesn’t give me the option to expand in the shop it only shows the toys. How can I expand ?!!!! Be sure that you’re looking under Shop and not Goodies because “yard expansion” will always be under Shop. I just wanted to let you know that the game is not yet available in my country, Belgium. Somehow, The Netherlands can access certain games way earlier than Belgium, so I don’t know it the problem lies with the game or with the Belgian legislation or whatever…. But if you could speed up the process somehow, I would really be grateful! I’m in no way connected to the development of this game, so I’m afraid I can’t help you there. 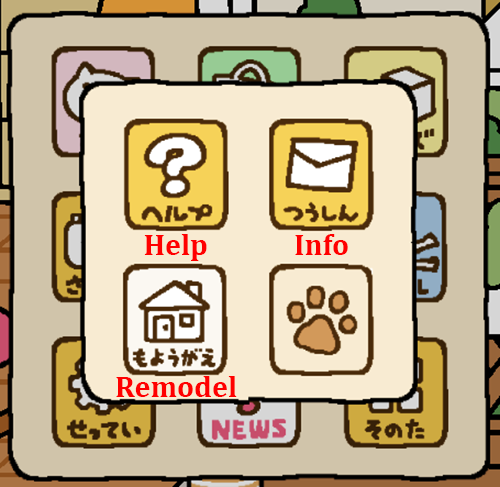 But if you click on the “How to Play Neko Atsume (Japanese version)” link at the top, I have directions on how to download the game in the case it’s not available in your country’s iTunes Store or Google Play. Hello I have a questiona and can’t seem to find an answer. My friend has some more items in shop than me. Her shop is 34 pages while mine is 32, How can I expand my shop? My shop also has 34 pages. Are you sure you have the most recent update? 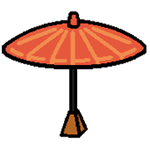 The new update has some new items, and that would be the only way to expand your shop. I was able to continue my progress by restoring my phone from a backup from my computer, and i have iOS. Does the game crash normally because of a few minor bugs? or is that because of the terrible IPod 4th gen I have? Hi! I’m from Poland and I have a Windows phone (Nokia Lumia sth) and I can’t download Neko Atsume from the app store :< I'd love to play it, it's just so cute and calming ❤ I always steal my friend's phone (he's got Android) and when I'm feeling bad/anxious, I listen to the ost of the game. I'd be so happy if you could help me download it ;u; I love the game, have a nice day!